Everywhere you live, work, and play . . .YOU ARE IN A WATERSHED. A watershed is simply the land that "sheds" rainwater to a certain water body. It's an area of land where all water running off the land drains to a specific water body (such as a stream, river, lake, wetland or ocean). Water may soak into the ground and become groundwater that flows to one of these water bodies. Am I in Curry's Fork Watershed? 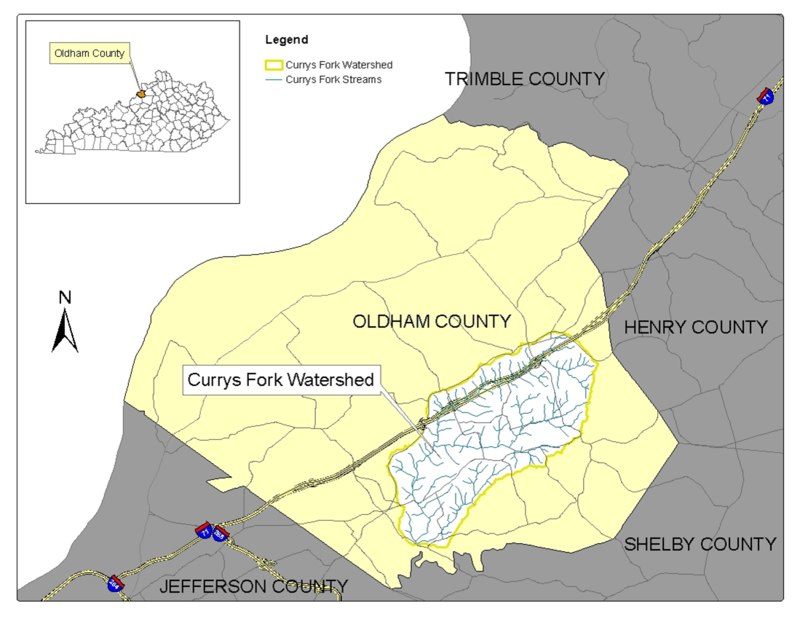 The Curry’s Fork watershed is located upstream of Floyd’s Fork in the southcentral portion of Oldham County, Kentucky. Most of the City of LaGrange is included in the northeast corner of the watershed, which extends southwest, roughly along Highway 146 to the eastern edge of the City of Crestwood. Curry's Fork watershed is roughly bordered on the north by the railroad tracks north of Interstate 71. The southern border runs roughly parallel with Montfort Lane. 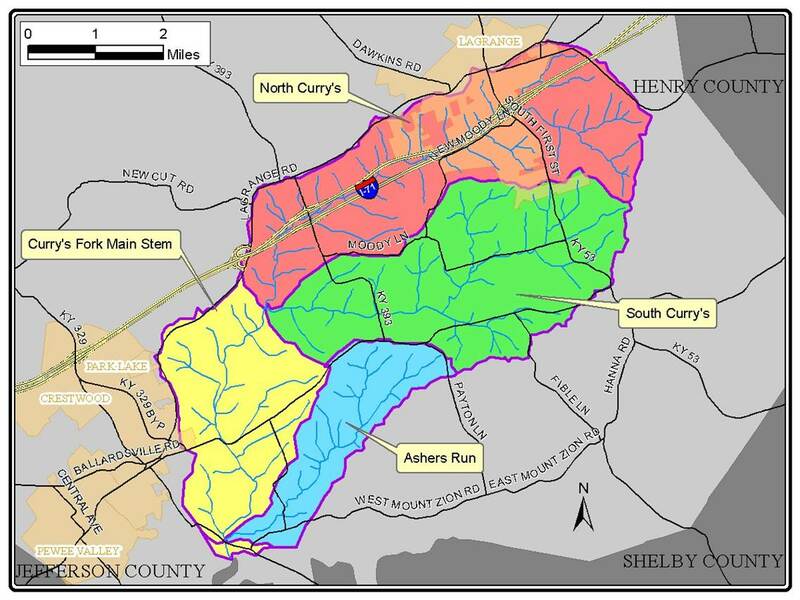 Look at the maps below to see if you are in Curry's Fork Watershed. Is the water safe in Curry’s Fork Watershed? Curry’s Fork is listed as a first priority stream by the Kentucky Division of Water (KDOW), meaning that the waters are impaired and do not meet water quality standards. The suspected pollutants include sediment, bacteria, low dissolved oxygen and alteration of stream path. As part of a U.S. Environmental Protection Agency grant through the Kentucky Division of Water, Oldham County Fiscal Court performed a detailed study of the Curry’s Fork streams. This effort involved developing a watershed plan, which addresses sources of pollution and identifes solutions for cleaning up Curry’s Fork streams. Thanks to additional federal grants, Oldham County Fiscal Court is now implementing key initiatives in the plan and working to improve our water for future generations.